For those who are familiar with the metric system, the term kilogram is instantly recognizable as a unit of measurement for weight. Recently, however, this commonly-used unit of measurement has undergone a makeover. The reason that the kilogram has been replaced is that it has gradually changed. Now, it may seem baffling as to how a unit of measurement can change over time, but the answer lies in the hunk of metal that the kilogram was based on. The original mass of a kilogram was determined by a cylinder of platinum-iridium alloy located in a secure French vault and known as Le Grand K. It’s considered to be one of the seven integral units of measurement in the “SI” or International System of Units (aka the metric system). In 1875, the Treaty of the Meter was signed in order to establish the international standard for measurements of the kilogram and the meter. Subsequent to the meeting, the artifacts that defined “a meter” and “a kilogram” were locked securely in a vault at the International Bureau of Weights and Measures, and copies were kept in other countries. Then in 1990, scientists found out that Le Grand K had lost about 50 micrograms, making it slightly lighter than the distributed copies. The problem with having a physical object as a set standard for a measurement is that there is always the risk of the object becoming damaged in one way or the other. Therefore, scientists started looking into standards of measurements that are tied to constants in nature. In 1983, they calculated a fractional value of the meter relative to the speed of light; in other words a meter is the length of the path traveled by light in a fraction of a second. Another example is the second which is no longer tied to the rotation of our Earth (which can speed up or slow down) and is instead measured in terms of the time taken for radioactive decay of Caesium-133 atoms! 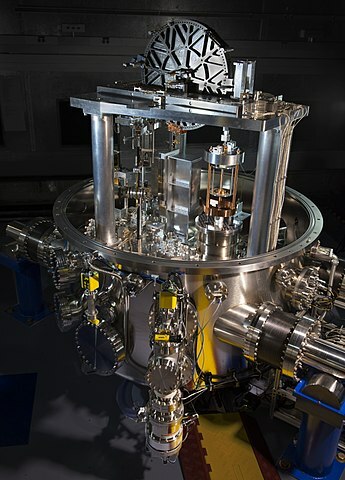 Scientists have been looking to connect the kilogram to a value known as Planck’s Constant. This constant is defined in quantum mechanics (a field of study of sub-atomic particles) and is a function of the energy carried by a single particle of light (a photon) and its frequency. However, creating such a measure has not been easy as there was no accurate way of measuring Planck's constant. A breakthrough happened when Bryan Kibble, an English scientist set out to improve the ampere balance that measures the relationship between electrical currents and weight. Working with his colleague, Dr. Robinson, the pair successfully built the first Kibble Balance in the 1970s that could calculate Planck's constant accurately to up to eight decimal digits. The combination of the Kibble balance and a few other discoveries led scientists to finally define the kilogram in terms of a universal constant. It has taken 20 years but we can now safely say that the original platinum cylinder is dispensable. The recent vote on November 16th confirmed that the kilogram will officially be redefined on World Metrology Day (May 20) of 2019!